Printer Problem or User Problem ? If it works ,don’t change it..
Fussy and prone to paper jams, the printer has been trying tempers in offices and homes since the dot-matrix days when paper came in perforated accordion stacks. As other gadgets, from flat-screen monitors to wireless mice, have sprinted ahead toward gasp-inducing irresistibility, one electronic has failed to thrill. In ‘Office Space,’ Peter (Ron Livingston), Michael (David Herman), and Samir (Ajay Naidu) take out their anger on the printer. The scene is widely imitated online in YouTube videos. The problem, sometimes, isn’t the printer. It’s the people printing, printer manufacturers say. Rough handling and mistreatment often upset sensitive machinery. "With computers, people don’t want to mess with it. But with a printer, everyone thinks he’s a mechanic,"
Hewlett-Packard Co., the leading maker of printers, said this month that its new printers would come with email addresses, so users can print from smartphones or any other Web-enabled device. It also has laser printers that automatically detect the location of a paper jam and show users where to find it on the screen. H-P says its inkjets failed 25% less often in 2009 compared to 2006, and laser printers improved 20%. The company declined to say how often the machines still misbehave. For decades, the printer has tried the tempers of many in workspaces and home offices. Topping the list of common customer complaints are paper jams and problems connecting to a printer. In inkjet printers, the ink often dries out or gets clogged. In laser printers, the culprit is often the fuser, the part that presses the toner to the page and can cause some elements, such as stickers or labels, to melt. Xerox Corp. makes what it calls "self-healing" machines that monitor their components to anticipate problems and adjust automatically. For example, the printers, starting at $399, can sense internal temperature and humidity and recalibrate their performance accordingly to maintain a consistent print quality. Xerox printers can also automatically notify Xerox when they need new parts or service. Although I doubt this printer is going to be notifying anyone that it needs repair…. One recent afternoon a printer repair company, received an "emergency" call . They found found a HP LaserJet 3390 churning out pages marked with eight circular “bruises”. Donald Barthelemy, 26, has been a Paramus, N.J.-based technician with Best Buy Co.’s Geek Squad for six years. He makes four to five daily service calls to homes and businesses, and three to four of them involve printer-related problems. (Geek Squad declined to say how much of its business company-wide comes from printers.) Often, Mr. Barthelemy says, the machines show signs of neglect (dried-up ink cartridges) or abuse (broken parts). Man-on-printer violence is a burgeoning YouTube subgenre. 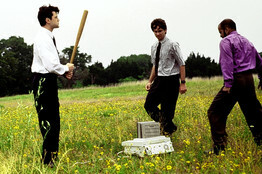 Many videos pay homage to the 1999 cult classic film "Office Space," in which the heroes abscond with their employer’s printer, take it to an empty field and beat it with a baseball bat. Fed up with the cost of ink cartridges, he says, "the printer didn’t make the cut." Print periodically. Disuse can cause ink to dry up and clog the cartridge head. Store paper flat. Extra paper left standing vertically is more likely to bend and jam. Clear jams gently. Yanking out the paper can damage rollers. Update software. Driver updates address user-reported issues and can fix bugs. Printer manufacturers compete fiercely on price. Many home models cost less than $100. In general, the profit margin is higher on ink refills than on printers themselves. HP now sells cartridges for as little as $10, and Lexmark for as low as $5. More companies are urging people to cut down on printing not just to save paper but also to save money. Those small desktop printers, "they’re pieces of junk," says Larry Frydman, owner of Computer Professionals USA, a New York network and printer maintenance company. "They work as long as they work, and when they don’t work, they’re meant to be throwaways."